Description: This is one holiday tradition that will be appreciated by all! Paperwhites are specifically chosen for indoor growing. They never fail to grow and bloom, are wonderfully sweet-scented, and their white blooms pair well with every décor. 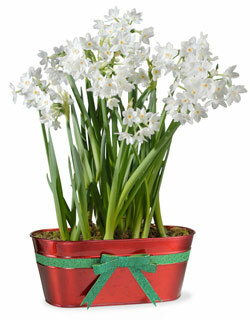 This gift includes 9 Ziva Paperwhite bulbs, pre-planted in a festive red tin that will make an impressive and elegant centerpiece. We top each gift plant with decorative moss, and pack for safe shipment to ensure it arrives ready to display. Simply water while the bulbs grow daily until they burst with an extravagant white presentation of flowers. Expect blooms in 4-6 weeks. Tin measures 10.5” x 5” x 4.25”.